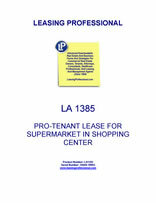 This Lease is made as of _________________, by and between COMMERCIAL PROPERTY LANDLORD, INC., a __________________ corporation ("Landlord"), and AGREEABLE SUPERMARKET TENANT, INC., a _________________ corporation ("Tenant"). The building to be constructed by Tenant at the Premises in accordance with the provisions of this Lease. The number of Rentable Feet in the Building, which will be no less than __________ thousand (______), which shall not include the Expansion Area. A pad-ready building area of approximately ________ square feet prepared in accordance with the Site Design Criteria set forth on Exhibit E.
A day on which the majority of businesses are open in the State of ____________, which shall not include Saturdays, Sundays or holidays recognized by major businesses in the State of ____________. All areas of the Shopping Center which are not contained within the blue lines of any building envelope on the Site Plan, including all parking areas, utilities to the point where they enter a building, landscaped areas, sidewalks, driveways and alleys. Common Areas shall also include all easements, accesses, improvements, and rights serving or benefiting the Shopping Center, even if not located at the Shopping Center. An amount equal to ________ Dollars ($___) times the Building Area. A construction bid for the Building, which shall only include the following expenses: the building shell; truck dock, dock pad, screening walls, trash enclosures, building mounted signage (if any), roofing; flooring; interior and exterior finishes; electric cabling; mechanical and electrical systems; premiums for Builder's Risk Insurance and Labor/Material Payment and Performance Bonds; building permit; water, sewer and utility hookup, availability or tap fees; sidewalks and floodlights on the Premises; canopies for the Building; standby fuel facilities, if required; the Contractor's general conditions, not to exceed four percent (4%) of the remainder of the Construction Bid amount exclusive of the Contractor's general profit and overhead; and the Contractor's general profit and overhead, not to exceed four percent (4%) of the remainder of the Construction Bid amount exclusive of the Contractor's general conditions. The sum of (a) the Construction Bid which is accepted by Tenant, (b) the cost of Tenant's Architect's services and expenses, and (c) the cost of Change Orders. The sum of (a) a Construction Bid, (b) $___ times the Building Area (which amount is the estimated cost of Change Orders), and (iii) $____ times the Building Area (which amount is the estimated cost of Tenant's Architect's services and expenses). The lesser of (a) the maximum interest rate permitted by law or (b) two percent (2%) greater than the prime rate of interest announced by ____________ from time to time as its prime rate for unsecured loans, regardless of what rate such bank actually charges its customers. Any of the following (as the same may be amended from time to time): the Comprehensive Environmental Response, Compensation and Liability Act of 1980; the Super Fund Amendments and Reauthorization Act of 1986; the Federal Resource Conservation and Recovery Act of 1986; the Clean Water Act; the Clean Air Act; the Toxic Substances Control Act; any regulation promulgated by a regulatory body pursuant to any Environmental Law; and any other Law or Rule which relates to or deals with human health or the environment. Any of the following: asbestos; urea formaldehyde; petroleum hydrocarbons and other petroleum products (including gasoline, diesel fuel, fuel oil, crude oil and motor oil and constituents of those products); tetrachloroethylene; polychlorinated benzyls; polychlorinated biphenyls; biological hazards; nuclear fuel or materials; chemical, biological or medical wastes; radioactive materials; explosives; known carcinogens; underground storage tanks; and all dangerous, toxic or hazardous substances defined as hazardous or as a pollutant or contaminant in, or the release or disposal of which is regulated by, any Environmental Law. _____________ or such other architect selected by Landlord, acceptable to Tenant in its reasonable discretion. All present and future federal, state, and local laws, zoning requirements, ordinances, rules, and regulations of any duly constituted authority affecting or respecting the use or occupancy of the Premises or any business conducted on the Premises, or affecting or respecting the Premises generally, whether or not they also affect the use or occupancy of the Premises or the business conducted thereon. The areas outlined and indicated as such on the Site Plan. The matters described in Exhibit C.
That portion of the Shopping Center outlined in red on the Site Plan, including access to the Premises and truck loading areas, and including the Building and any other improvements constructed on the Premises now or in the future. The earlier of (a) Tenant's opening of the Building for business with the public; or (b) the later of (i) ten months after Landlord delivers a completed Building Pad to Tenant; (ii) all improvements to the Common Areas necessary for operation of the supermarket to be operated in the Building (including all three driveways) are completed; and (iii) all improvements shown on the highway occupancy permit, including traffic signals, are completed. The actual number of square feet of finished building space, including any and all floors, but excluding mezzanines not used for sale purposes, measuring each floor to the outside of exterior walls and to the center of any common walls. The real property located in ____________ and legally described in Exhibit A, as outlined in brown on the Site Plan, together with any and all buildings and improvements constructed thereon now or in the future. The Shopping Center includes, and all provisions contained in this Lease relating to the Shopping Center shall apply to, the Common Areas, the Premises, the Building and all other areas included within the area outlined in brown on the Site Plan. All of the following: (1) Evidence that application has been made for a Highway Occupancy Permit along with copies of the application and related documents (Execution Date); (2) a certification from Landlord that there is no building line or occupancy restriction, condition or covenant of record or any physical matter which would interfere with or materially adversely affect the construction or operation of the Shopping Center; (3) certified topographical plan; (4) certified grading and drainage plans and building floor elevations for the Shopping Center; (5) certified engineered utility plans for electric, natural gas, sanitary and storm sewer, and domestic and fire protection water for the Shopping Center; (6) plans for the exterior design of the buildings in the Shopping Center (other than the Building and theater) and the structural design of any building which will be adjacent to the Building (within 60 days from the date Tenant submits Tenant's Plan to Landlord); (7) certified soil borings and investigation reports; (8) certified compaction tests and reports (to be submitted periodically during construction as produced); (9) certified traffic studies; (10) any environmental assessments or reports in Landlord's possession or control; (11) (a) evidence that Landlord has obtained Labor and Industry Approval (90 days after Execution Date), (b) a final site plan, (c) a building permit and (d) a certificate of occupancy for the Shopping Center (exclusive of the Building, at the completion of construction of the Shopping Center) (Tenant shall be responsible for the certificate of occupancy for the Building); (12) site lighting plan, including photometrics; (13) landscaping plans; and (14) certified Common Area plans and specifications. All Site Information shall provide complete information with respect to the Shopping Center in general and the Premises in particular. The site plan attached hereto as Exhibit B. The portion of the Common Area outlined in green on the Site Plan, including any access drives, delivery and service areas, curbing and parking lot lighting within such area. _____________ or such other architect selected by Tenant, acceptable to Landlord in its reasonable discretion. The plans and specifications for the construction of the Building, including any addenda and Change Orders. All fixtures, trade fixtures, machinery, equipment, furniture, sinks, signs, sign standards, exterior lights, light standards, and other personal property kept or installed on the Premises by Tenant. A fraction, the numerator of which is the Building Area, and the denominator of which is the number of Rentable Feet in all buildings in the Shopping Center (including the Building); provided that under no circumstances shall said denominator be less than ____________ thousand (_______) regardless of the actual amount of Rentable Feet in buildings in the Shopping Center at any time. Landlord hereby demises and leases to Tenant, and Tenant hereby hires and takes from Landlord, the Premises. Landlord also grants to Tenant, its customers, licensees, invitees, subtenants and assigns, in common with other tenants of the Shopping Center, the non-exclusive right to use the Common Areas for ingress, egress and parking in designated areas. Except for any mortgage on the Shopping Center or any exclusive or other agreement not prohibited by Section 9, Landlord will enter into no contract, lease or agreement of any kind which materially adversely affect or limit Tenant's use of the Premises or materially adversely affect or limit Tenant's use of the Common Areas. Tenant acknowledges that the third driveway as marked on the Site Plan will service properties other than the Shopping Center. Upon paying the rent and performing the covenants agreed to be performed by Tenant, Tenant shall peaceably and quietly have, hold and enjoy the Premises and Common Areas of the Shopping Center until the expiration or earlier termination of this Lease. The initial term of this Lease shall commence on the Execution Date and shall end twenty (20) years after the Rent Commencement Date. Following the Rent Commencement Date either party will confirm in writing, within thirty (30) days after written request of the other party, the Rent Commencement Date, the number of Rentable Feet in the Building Area and the Minimum Rent. Provided Tenant is not in default under this Lease, Landlord hereby grants to Tenant the option to extend this Lease for one (1) period of five (5) years, and one (1) period of four (4) years and ten (10) months, both upon the same terms and conditions and at the rental as provided in Section 10.1, the first such period commencing upon the expiration of the initial term. If Tenant exercises an option to extend, Tenant shall notify Landlord of such exercise in writing at least one hundred eighty (180) days in advance of the commencement date of the applicable extension period; however, if Tenant fails to provide Landlord with such one hundred eighty (180) day notice, Tenant's right to extend this Lease by notice to Landlord shall remain in full force and effect for a period of thirty (30) days after receipt by Tenant of subsequent written notice from Landlord setting forth the expiration date of this Lease and advising Tenant that Landlord has not received a notice of extension. If this Lease has been assigned, the original Tenant must also execute the extension notice for such notice to be effective. Subject to the provisions of Section 8, at the expiration or earlier termination of this Lease, Tenant shall surrender the Premises to Landlord with those portions of the Premises which Tenant is responsible to maintain under subsection 16.2 in broom-clean condition, in substantially as good condition as when Tenant received the Premises from Landlord, subject to: (a) reasonable wear and tear; (b) damage by fire or other casualty which is not Tenant's responsibility to repair; (c) Landlord's repair, maintenance and replacement obligations; and (d) damage or deterioration caused by the negligence of Landlord or other occupants of the Shopping Center, or any of their agents, employees, contractors, customers or invitees. Tenant shall not be required to remove any additions or alterations or restore the Building or the Premises to their original condition at the expiration or earlier termination of this Lease; provided, however, if the Lease is terminated because of Tenant's default within ten (10) years after the Rent Commencement Date, Tenant shall restore the Premises to substantially its original condition, reasonable wear and tear excepted. Tenant shall promptly remove all of its equipment in the Premises at the expiration or earlier termination of this Lease. Unless Landlord provides to Tenant, within thirty (30) days following the expiration or earlier termination of this Lease, a notice stating that the Premises were not surrendered in the condition required by this Lease and specifically listing the portions of the Premises which are not in such condition, the Premises shall be deemed to have been surrendered in the condition required by this Lease. At the expiration or earlier termination of the Lease, Tenant shall assign to Landlord all warranties for property which remains in the Premises. Any alterations, equipment or personal property remaining in the Premises after the termination of the Lease, described in Landlord's notice and not timely removed by Tenant, shall be deemed abandoned and may be removed and disposed of by Landlord at Tenant's cost and expense, which cost and expense shall be paid within thirty days after demand. Landlord shall have no obligation to store any such items.